I'm so excited. I'm thinking ahead to our next free BOM. I'm just about done with the current one so I'm in the process of "shifting gears" as I plan for the next one. My friends will all tell you that at this spot in the process I usually turn to them for ideas. But this time that will not be true. I want you to help me design the next free BOM. I started outlining some questions I would ask of you. That is when I realized there are a lot of decisions that need to be made and that you can help with most of them. Here are just a few of those questions. 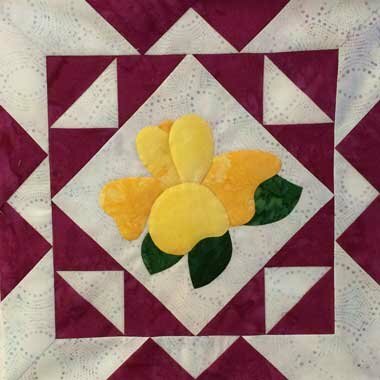 What should the theme of the quilt be? What size should the quilt be? What colors should we use? Then I realized that each question would lead to other questions. For example, if you choose the theme of "flowers", the next question would become which flowers. Roses? Poinsettias? Daffodils? Crocus? Fantasy flowers? All types of flowers? It is evident that there are numerous questions to be answered and I can only ask one question per month. It looks like I better get busy. That does present problems for me. As I looked at getting this process started, I realized that it was difficult to even select the first question. Should it be "What type of quilt do you want?" or should it be "What theme do you want for the quilt?". Both are valid questions and both need to be answered early in the design process. I have decided to ask the first question this month. But I want you to also consider the answer to next month's question at the same time. 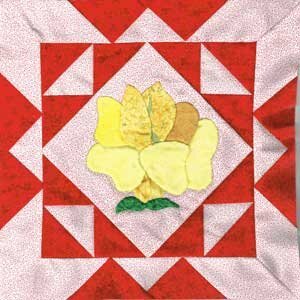 Next month I will offer you two choices for the theme for the quilt. You will be able to select from a) flowers or b) critters. 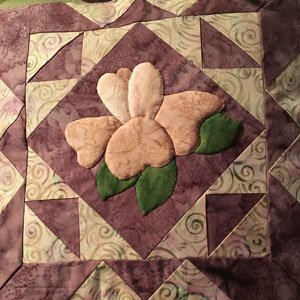 This is your opportunity to help design a quilt to your specifications. We will vote by e-mail. Each month I will ask a question and offer several possible answers. You select the one that appeals to you the most then send me an e-mail with that answer in it. Each month I will tally the vote and depending on your choice will then select the next question to be answered. I'm not sure exactly how long this process will take. It will be directly dependent upon the selections you make each month. Sounds exciting, doesn't it? Question: What type of quilt would you like for our next BOM which will probably start in January, 2017? I realized as I was writing this newsletter that I have requested several times that you check out pages on my website. When you are done you will want to return to this newsletter. To do that you must click back using the back arrow in your web browser. This is true because you can not get to this newsletter from my website. The only way you can get to this newsletter is through the link in the e-mail that I sent you. Coralie is the first to send me photos of our current, free BOM. Aren't they beautiful. I like both but am particularly fond of the one to the left. As a girl growing up my parent's bedroom was done in red and purple. I had forgotten how lovely it can be. I'll have to think about using that color combination in one of my quilts. I have added Coralie's blocks to our gallery pages. Just click on the link below and select either Month 1 or Month 2 to see Coralie's blocks along side Karen's and Georgie's blocks. Send me photos of your blocks and I'll include them in my newsletter and on this gallery page. Click to see gallery page. Each month since we began our new, free BOM, I have used a different batting to sculpt the flowers. I have then written a brief review of my opinion of that batt for sculpting flowers. This information was placed in a table. I decided this week that it was information that belonged on my website where you will be able to find it even after this BOM is concluded. So I have moved it from this newsletter to a page under "Quilting Tips". Click here to see the batting table. Scroll down to "Analysis of Batting for Sculpting Applique Patches". 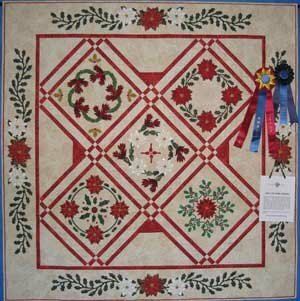 I'm so pleased to announce that Karen Brandt's "Christmas Memories" took first place in the Applique/Large category of the 2016 Quilt Arizona Show. Not only that Karen also received the AZ Quilters Hall of Fame Award. We are so proud of you, Karen. Your achievements are an inspiration to all of us. This month's free BOM block is an easy one. 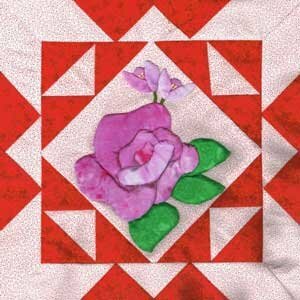 "A Simple Rose" will stitch up quickly in just about any color that you would like as roses come in just about every color. Karen Johnson, Webster City, Iowa 50595 This month we each went our own way when it came time to make this block. Can you pick your favorite? I can't. I love the peach of Karen's rose at the left. 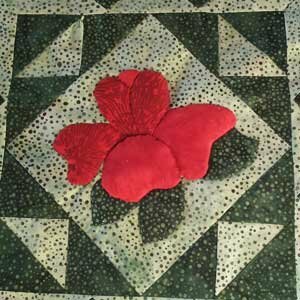 But red is one of my favorite quilt colors and Georgie has really made it pop in her block to the right. No matter your favorite color, I'm sure this block will look great. I would love to publish a photo of your block. Won't you send it to me at abqhaidle@mchsi.com Don't worry about the background. I'll crop the photo and prepare it for publication. But I can't do that unless you send me the photo first. I'm looking forward to receiving it. Click here to download newsletter as a PDF file.